I was reviewing a possible "Low Quality Post" and decided to edit it. 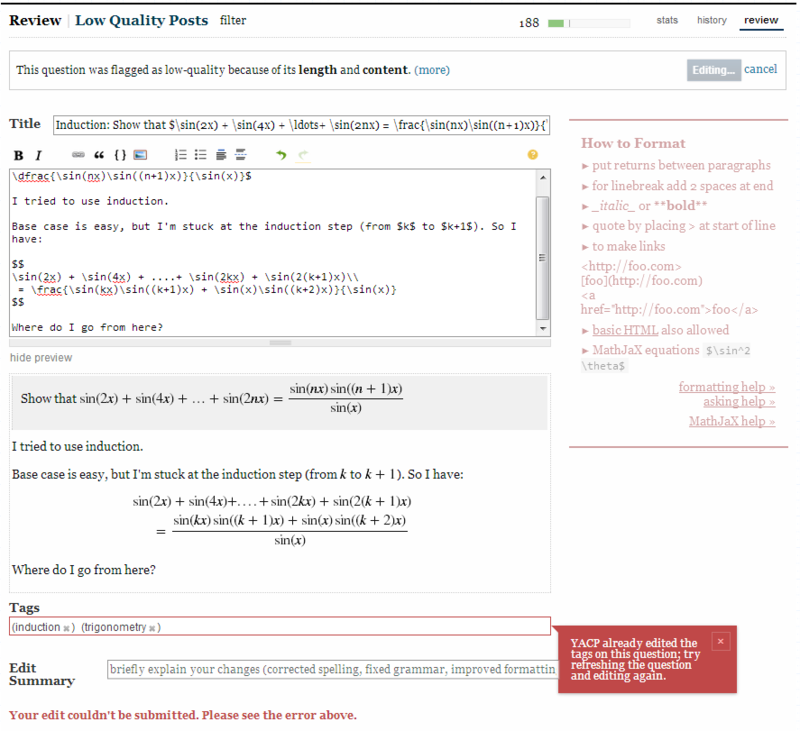 I completely revised title, body and tags to contain proper English, describe the post and improve the MathJax. This type of annoyance is quite common when doing a substantial revision in the review queue. This particular instance is worse than most, because only the tags were altered. Have a link/button available to load the tag edit asynchronously -- similarly for title edits. That is, let me stay in the current window, and when I click "load edit", replace the title/tags with the edited version. Being synced with the other edit, I can now decide to alter that part of the post as well, just as if I had started editing after the concurrent edit -- but without losing my precious edit of the question body. Please feel free to suggest other solutions in the answers. Edit: Added bug in view of this MSO thread. Browse other questions tagged discussion feature-request bug editing review . What to do if you don't have 2,000 rep to rollback an edit? What a good title should be?